In partnership with Transformance Music, Sinfonia Viva and Orchestras Live, LSMS have delivered a creative project with nearly 50 students from Birkett House, Maplewell Hall, Birchwood and Ashmount Schools. 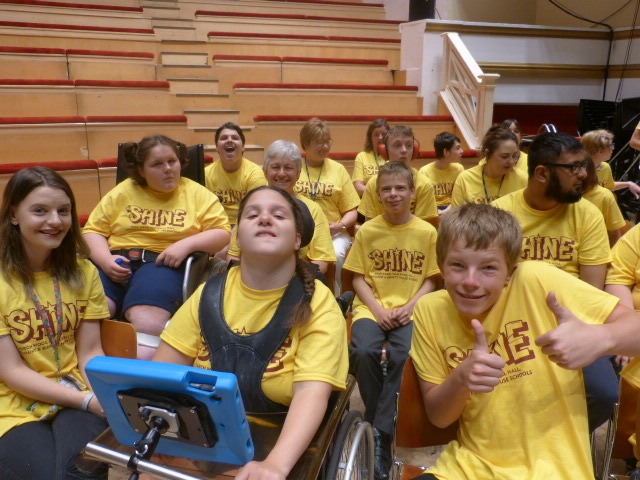 The project culminated in 3 performance days including De Montfort Hall on June 27th. Please see below for a short film about the SHINE! Project. The project started back in January with Ben Sellers, Lead Musician atTransformance Music, delivering weekly iPad band sessions to students in Birkett House and Maplewell Hall. The students learned how to produce music using several apps on iPads, including Garage Band and Thumbjam. Once they were familiar with the apps, the young people began, with support, to create their own chord sequences and to improvise melodies. Students had to make decisions as a group about which chord progressions to choose, the instrumentation and which motifs to use. The 'groove' composed by students at Maplewell Hall was recorded and sent to Jack Ross, Workshop Facilitator at Sinfonia Viva, to creatively develop with students from Birchwood through creating a melody and song lyrics. The result; "Toot-Toot" was spectacular and very well received at the performances. Meanwhile, Birkett House students worked on several pieces with a very different feel, with their favourite piece being about pirates called "Treasure and Gold". The students rose to the occasion, performing using a combination of iPads and acoustic instruments. 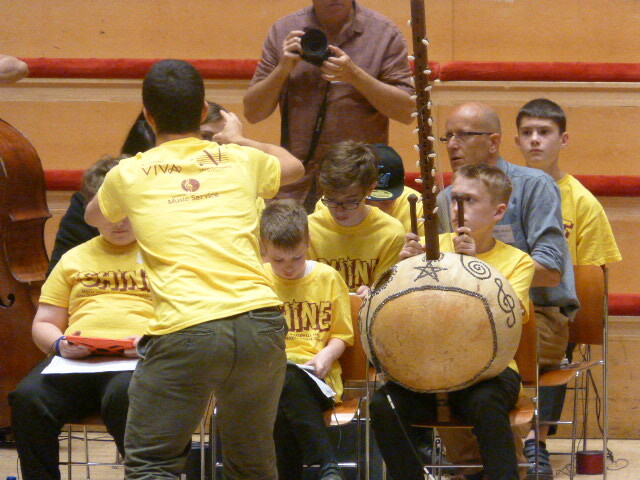 The students who have Physical and Multiple learning difficulties played solos improvised over a chord sequence which didn't leave a dry eye in the house when we first heard it performed alongside Sinfonia Viva on 21st June in Ashmount School. said one member of staff. "For these children to have such an opportunity to take part in an event such as this is massive. Kate Hallam-Jones, Music Teacher at Birkett House has worked with Ben, from Transformance Music, on a weekly basis and is now fully trained to continue to deliver the iPad band with her students next year. She will also be able to offer support and training to other schools in Leicester and Leicestershire to set up iPad bands in school. In addition to gleaning knowledge from Ben about iPad bands, Kate also developed a Unit of Work for the LSMS SEND Music Curriculum based on Ben's delivery. She is keen to support schools in the use of iPads in their lessons. At Ashmount school, the students worked with Jack, creating song lyrics and a melody line and amalgamated it with the electronic sounds created by students at Birkett House school. This finally became a song called "Diamonds Shine". After the performance at De Montfort Hall, Adam from LSMS said, "I just wanted to hear more." 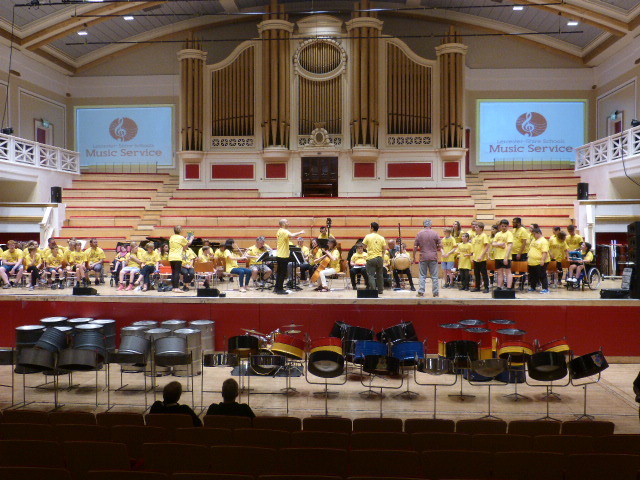 The performance at De Montfort Hall was very well received by all. It was the first time that all four schools had met together with Sinfonia Viva and Transformance Music, but after a brief rehearsal, they appeared as a single ensemble on the stage. "We want to do more of this" said one teacher. "They have loved every minute and have changed beyond recognition. It is just so important that it carries on." Another teacher added "When does the next project start?" Keep a look out for 'Toot-Toot', 'Diamond Shine', 'Treasure and Gold', '4 Times Hotter' and 'Shine' on the SEND Schools page of our website. The young people and audience enjoyed these songs so much we are creating the soundtrack and performance resources for students in other SEND settings to be able to access these songs. 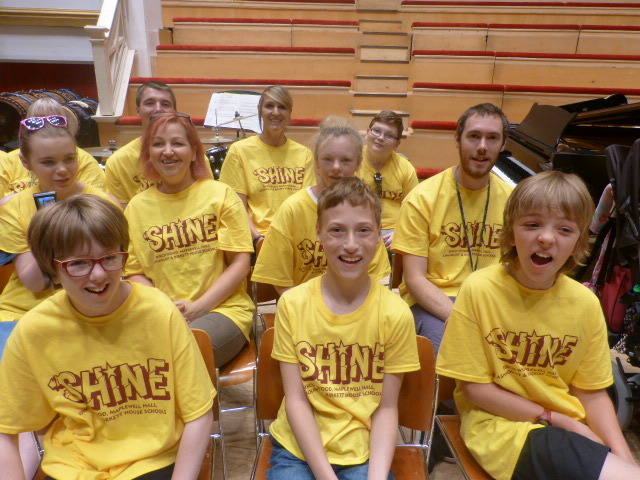 The SHINE project will not just have an impact in SEND schools. During the project Brad Smith, the Lead for Music Technology at LSMS, worked alongside Transformance Music to create 'How To' guides and video resources on how to use the apps demonstrated by Ben and how the use of them can be developed to use them creatively within iPad bands in the mainstream Primary School. "I just want to say thank you really. This project has changed my life. Before this, I never thought that I would be able to perform in public. It has helped me with my confidence and meant that I can do things that I never thought possible." 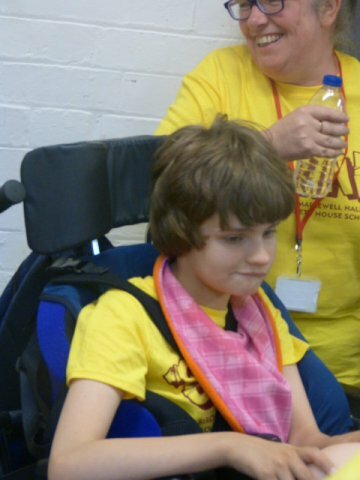 If you would like to have training to create an iPad band, contact sarah.share@leics.gov.uk For further information about SEND work through LSMS, please visit the SEND page on our website.